What is a silicon power cube? And what are these crazy SCRs, anyway? An SCR is an electronic switch. Just a quick review... What is a switch? A switch is a device that has two stable states, ON and OFF. When ON, the switch has a resistance much smaller than its load, and when OFF, it has a resistance much larger than its load. Semiconductor switches have recently been developed to handle large amounts of power. An SCR is a four-level diode. The figure at right shows the structure of the pnpn which consists of fur alternating layers of p- and n- type semiconductor, forming three pn junctions. Two of the pn junctions face the same direction, and the middle one faces the opposite direction. The pnpn has two states. It is OFF for negative voltage, and remains OFF for positive voltage until the threshhold voltage is reached, after which it turns ON. It remains ON until the current is reduced to a small value, after which it turns OFF again. The value of the threshhold voltage, Vth, can be controlled by the semiconductor designer over a small range. Typical pnpn diodes have threshhold voltages from 6 to 32V. 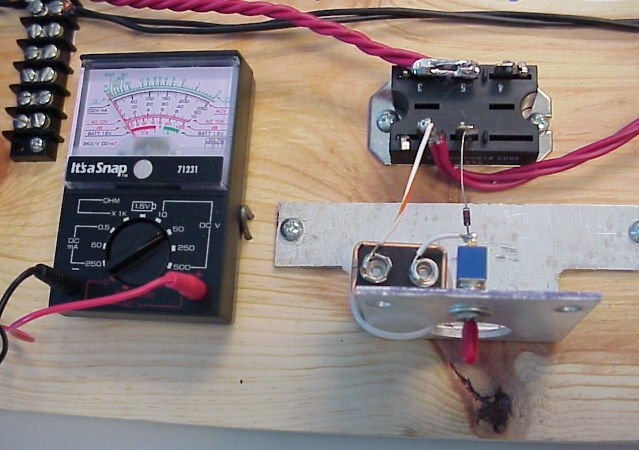 The SCR is a voltage-controlled switch, and it requires much more than 0.7V to turn ON. The SCR is particularly useful to coilguns, because it provides the timing we need. It is easy to turn on, and is guaranteed to stay on until the coil current drops to almost nothing. The silicon power cube is a high-power SCR available from Surplus Sales of Nebraska for a reasonable price (under $5 US). It contains both a high-power SCR and a high-power diode, rated for 100v @ 16 amp (handles 400 amp surge). The number PP1049A is stamped on the side, but also known as "M25/16-1K". The Mark II coilgun uses the SCR portion but not the diode. However, the diode may prove to be very useful some day as a "free-wheeling diode" or a protection device for this big inductive load. Yes the pin numbers are labeled out of sequence. Don't know why the manufacturer did that. You can compare this schematic to a photo of the same thing. There are little short pins alongside the big terminals on the corners at pins 1,3,4. Since I don't know what they do, I bent them over to keep them out of the way. This diagram at right illustrates the wiring of the silicon power cube into the Mark II coilgun. It is a view from above, looking at the pins of the SCR. Notice how the Gate must be brought to a positive voltage with respect to the cathode.